As an Aunt I always want to help my niece grow and learn. I want to bond with her as well as stimulate her senses. It also helps that my niece loves books. My First Book series by Sophie Helenek, includes four delightful board books, specially dedicated to infant's developmental growth milestones. 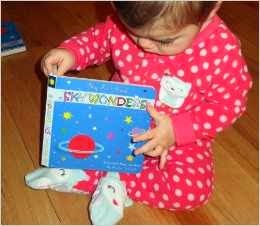 Each of the four books, Fruits, Sky Wonders, Shapes, and Musical Instruments include high contrast, black and white and bold color illustrations which promote visual and speech stimulation. Each picture has a simple word that my niece repeats which helps with her speech. These books are fantastic. My niece loved them. I personally loved the colors. They were not just in black and white. They included other colors like yellow and shades of blue and green. It kept my niece stimulated. The colors and shapes completely intrigued her. I am going to a baby shower in a few weeks and instead of a card they have asked for a book instead, I will definitely be taking one of these. 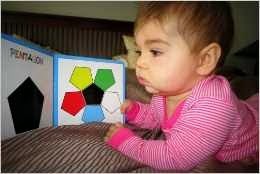 If given the choice I will always buy an educational gift over clothes for a baby. These children are our future. Love these books.